Well, by speak I mean, you read my words on it. See I’m going to explain to you why we are about to get these gales that we have predicted for damoarn (tomorrow (Thursday 14th June)). I don’t mean as in, pressure systems or all that meteorological hoohaa, which I depend on every day, thank you Judith Ralston, I love you, but I’m talking about WHY we are getting wind tomorrow. Does this make sense? It doesn’t matter cause I’ll explain it anyway. 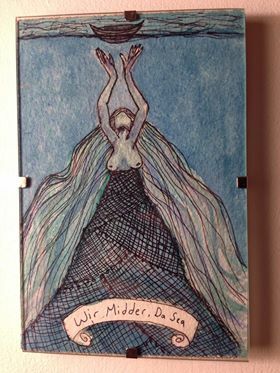 Sea Midder/Sea Mither (Sea Mother) is a key deity for the Northern Isles. She protects those at sea, calms the waters and brings life in the Spring. She is in an almost constant battle with Teran, the Winter spirit, a monster from the deep. Every hairst (autumn) Teran shakes off his bonds and rises from the depths to battle with Sea Midder, and on land we have the the shrieking winds and tattered skies. Called here the gore vallye (Autumn tumult), which is that period of gales in September/October. Eventually Teran beats Sea Midder, till she drifts, unconscious, to the bottom of the waters. Teran then reigns over the earth, bringing winter with his very breath. Plants die, the earth becomes cold and winds rage. During this time Sea Midder lies, recuperating on the ocean floor, till at last she has the strength. She makes bindings and rises to fight Teran again in the Voar (Spring). Once again the land is battered with winds and screams as the two struggle in competition. This is known as the vore tullye (spring struggle). This is why we have gales and a rush of wind in March/April. Eventually Sea Midder defeats Teran and binds him in the ropes then casts him to the bottom of the sea. Sea Midder reigns again, bringing warmth and life over the lands. Plants grow, animals are born, days grow even longer and warmer and the winds cease. Every now and then Teran struggles against his bindings whilst lying on the sea bed. This lashing and writhing creates the Summer gales. So there you have it. The gales coming tomorrow are the prediction of an angry Teran fighting for an early freedom. Not yet Teran, not till the hairst, let Sea Midder continue her life bringing reign for several moons yet. Much more explicable than the STV weather report. 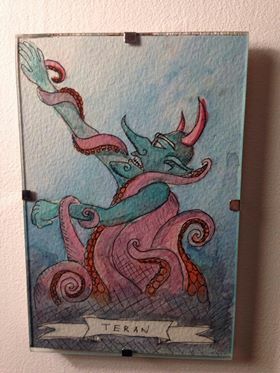 I shall say good morning to the Sea Mother tomorrow morning & wish her luck in her travails. This is such an awesome story. Thanks for relaying it. Are you planning on stalking me? on WHAT YEAR IS IT? !